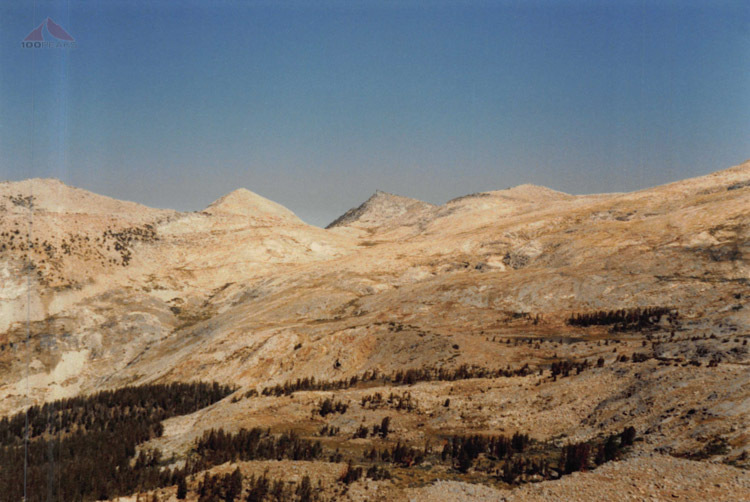 In 1987, I went on a backpacking trip to the Tunemah Trail near the LeConte and White Divides, in the Sierra Nevada. Using photos, maps, and cryptic captions, I performed research in 2015 and slowly found out where we really went. This will probably be the longest blog post I'll ever write. I am writing this in order of my discoveries. The captions on the original photographs below are what was written on the reverse side of the photos in pen. Only slight adjustments were made on the photos, as no retro filters were necessary. As I wrote this intro, I didn't even know the order of campsites, how many nights we had been out, or where we had hiked. This completely fascinated me, but may not interest you at all. You have been warned. It started with the purchase of two scanners in 2015. I purchased one of them to enable me to go paperless. I was opening a hamburger restaurant in Escondido and wanted to simplify my life before I got buried under a pile of paper. The second scanner was to scan negatives. I wanted to be able to leave my home during an emergency and not worry about precious photographs. I have unlimited cloud backup and wanted to take advantage of it. I pulled old boxes down from the heights of my garage, and dug into the archives. I found plenty of photos, but, more importantly, I found the original negatives. Pictures that I had given away were found again. Photographs I hadn't seen in decades were suddenly alive on my monitor, waiting to be enjoyed and organized. I came across an old photo envelope. 'For Derek' was written on the outside. This one envelope didn't match the others; it wasn't a photo lab that I had ever used. I remembered what was inside. I pulled out the photos and saw myself at age 15, encumbered by my father's backpack, which was then mine. I was hiking in short white shorts with socks nearly up to my knees. A white legionnaire's hat protected me from the sun and flies, and Reebok high tops dangled from my backpack, 80's camp shoes. And, of course, the ever present Ensolite Pad, blue, thin, and indestructible, was rolled around my tent poles. Ink stains from the caption written on the back of the photo stacked upon this one hovered cryptically in the sky. Memories of the trip trickled back to me. I didn't actually forget the trip. I just hadn't thought about it in years. I didn't know the exact year, I assumed it was around 1989. I had hiked with two adult couples and I was the only 'child.' For some reason, all the other kids from my Boy Scout troop opted out of this trip. I remember I carried my own food and 2-person tent. I remember riding horses on the way in and being saddle-sore for the remainder of the trip. 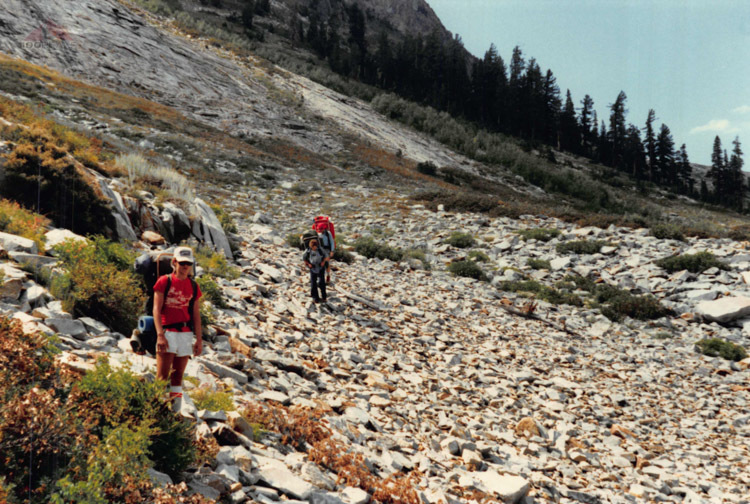 I remember a lot of talus and avalanche slopes, traveling cross-country over shifting boulders and fallen trees. I remember a lot of debates over where we were and where we were going. I remember the word "precarious" was spoken many times, as we scrambled over large obstacles on steep mountainsides. But there were a lot of things that I didn't remember. When did the Tunemah Trail Backpacking Trip happen? 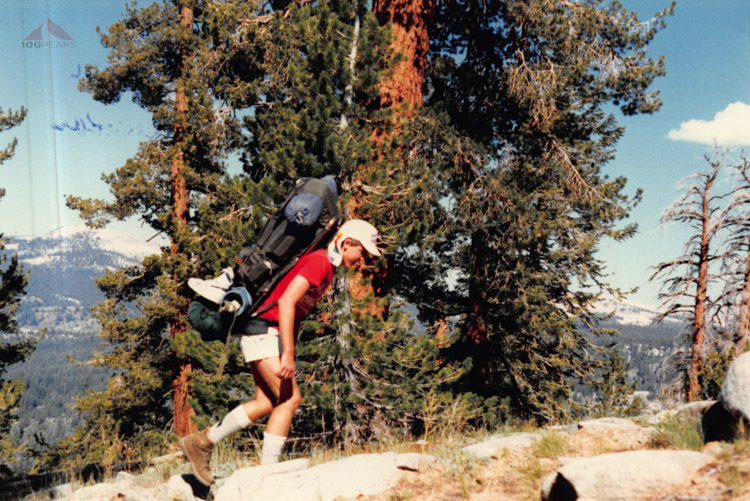 In my youth, I had gone on many short backpacking trips, but only three that were worthy of the name Sierra Trip. 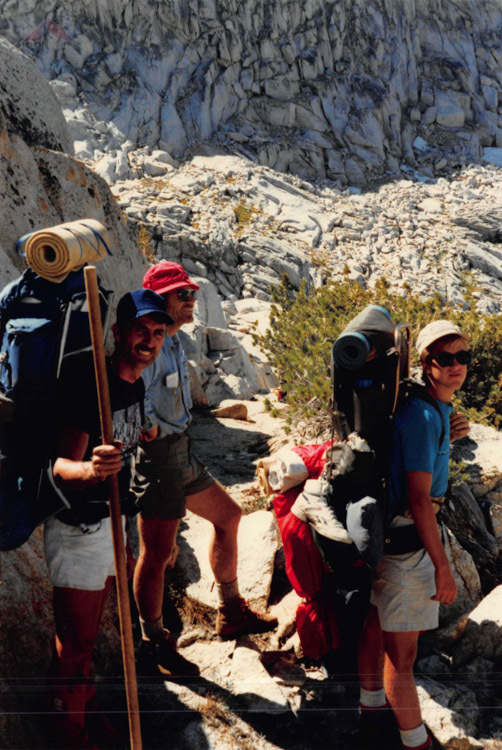 My first Sierra Trip, in 1984, which was at age 12, was to Mount Whitney, had left me exhausted, both physically and emotionally, and wondering if I would ever try something like it again. When did this trip to the Tunemah Trail happen? 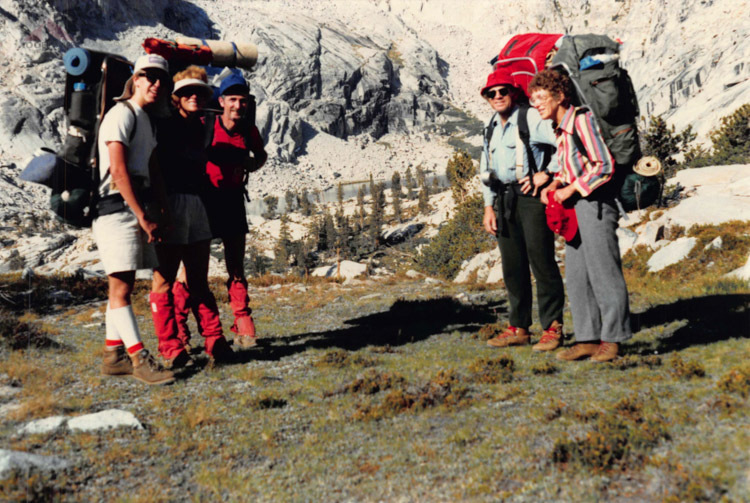 I searched my garage and found a video tape of another Sierra Trip, a VHS tape marked 'BACKPACKING WISHON TO CARTWRIGHT 1986 7/27 - 8/23.' This is another, easier, mystery to solve and another future blog post. I still didn't know when this trip happened. I remember possibly being around 15 for this trip, which would place it around 1987. I hooked up an old USB drive which has my old Outlook archives (I am now a Mac/Gmail person) and searched for an email I shared with my old Scoutmaster back in 2009. I had obtained his email address from his daughter when I was first starting 100 Peaks and wanted to thank him for laying the foundation of my love of the outdoors. My childhood memories are firmly rooted in riding in his late 70's/early 80's Ford Econoline Extended Van, which to this day can be seen on Google Street View, parked in front of his house, in perfect condition. Our troop went on a lot of trips in that van, towing canoes to the Colorado River, rock climbing in Joshua Tree, and many places beyond. I wanted to email him to let him know I was trying to solve the mystery of this trip. He doesn't check his email very often, but I composed a quick email, letting him know that his legacy of the love of the outdoors continued to my daughter, who now backpacks and hikes regularly with me. I then asked him about this trip, what details he remembered. There was no answer for days. But 1987 was the answer when the reply came. I had been 15 years old. Where did we go? The clues will show me. I started examining the pictures and the captions on the reverse. I initially thought it was my Scoutmaster who wrote them, but the context of some of them made me realize it was his wife, Nancy, who was the archivist of the two. The photos were numbered with some numbers missing, so I assume they pulled some photos that had me in it from a larger selection and gave those to me. I turned them over and read the captions. Some of them didn't have anything written on the back, but others had little phrases like, "Who knows?" "Packers Camp," and "From fishing lake," which wasn't very helpful. Others, however, held clues. Flipping through the rest of the pictures showed our group in a variety of places. Captions like "Going to Lake 10240" "Camel Pass" and "Big Meadow after Coyote Pass" were more descriptive. Googling these didn't reveal anything, so I kept on looking. I remember on this trip we rode pack horses in on the first day. So we could have started from anywhere. I looked at a picture of me, with a grin, with mountains sprawling behind me. The back read, "Last day - atop Crown Pass." Googling Crown Pass didn't yield anything, so I felt at a loss. I started watching the 1986 trip video, hoping to solve the mystery of that one and then realized that the 1986 trip had started at the Wishon Reservoir and then went eastward over Crown Pass. I had been over the same pass two years in a row and didn't even realize it. Memories starting flowing in from Crown Pass, helped by the video. There was a United States-shaped lake below it. 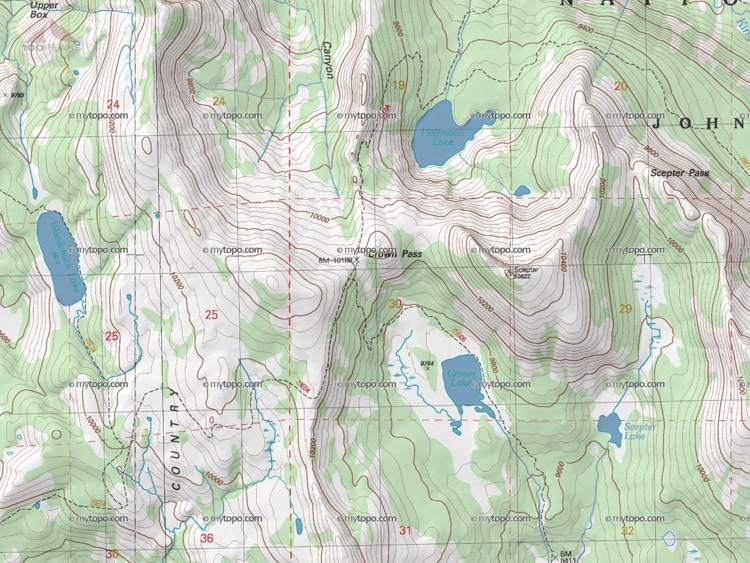 I scanned the topo maps east of Wishon Reservoir and saw it immediately. So I found a data point. We ended our trip by heading out through Crown Pass on our last day. It was something, and it piqued my curiosity. How much could I find out, just from the pictures? Could I map out my entire trip? At this point, I wasn't sure if my Scoutmaster was going to be getting back to me, so I dug deeper. Scanning the map, I found Coyote Pass, far to the east. I had found another data point. How far had we gone? I made a Google Map and start plotting what I could find, which wasn't much. I saw mention of the Tunemah Trail, but couldn't find very much about it online, much less a map. 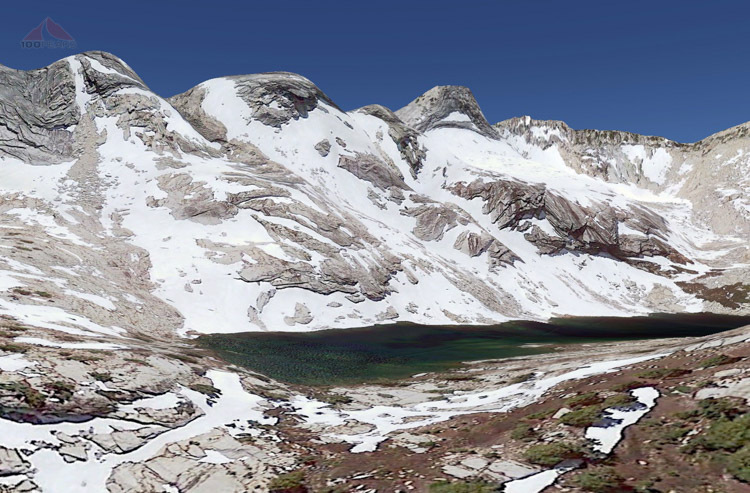 I was only able to find mentions of Tunemah Peak and Tunemah Lake. I scanned the map to the east of Coyote Pass. There is a meadow there called Big Meadow. I looked back at the pictures and saw one labeled, "Big Meadow after Coyote Pass." There is also a large meadow to the west of Coyote Pass. I wasn't sure which direction we had climbed that pass, so I looked at the picture. Any clues there? I scoured Google Earth and found a picture from Panoramio there called Blue Canyon meadow by dinger1, geolocated to the east of Coyote Pass and taken in August of 2011. Looking at this picture, taken 24 years after my visit to the same meadow, gave me chills. The rocky knob in the center was clearly the same, as well as the line of the ridge. I was onto something. We had entered the area by heading east over Coyote Pass. I started scanning the other pictures. Did any of them have any identifying peaks or features that I could find pictures of in Google Earth? I would pick a picture and click on tiny icons, opening up photos of the area. I could be looking anywhere. I tried to match up the picture with topo maps and tilted Google Earth. Hours flew by with no luck. Perhaps my meadow picture breakthrough would be the only one. I searched Google for Tunemah Trail and came up on the same hits as I got before. This time, I scrolled down until I saw Bob Burd's account of summiting Tunemah Peak. I read his trip report and scanned the photos until something caught my eye. His photo of what he called Dykeman Pass rang a bell in my mind. I flipped through my pictures and saw it. There it was again. The thrill of discovery. I stood in the same spot he had, 22 years earlier. You could even see the same rock he chose as his centerpiece right behind me, at a slightly different angle. This was getting fun. I scanned through the rest of his pictures with no new findings, except the name Alpine Creek, which is referenced on several pictures in my collection, yet with no landmarks. 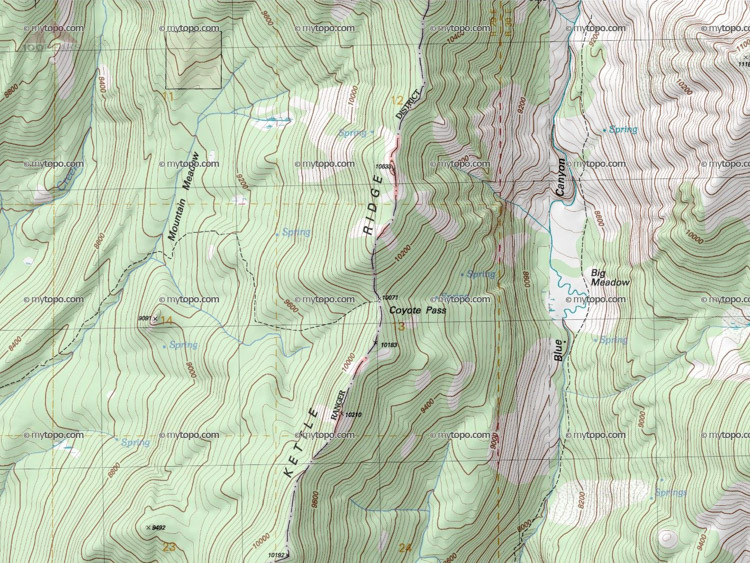 Even the term Dykeman Pass was hard to find, the name not even being on the topo maps. It turns out it is due west of Tunemah Peak, along the Tunemah Trail. Given Bob Burd's description, it appears we went over this past eastward, just as he did. Another data point, I assume. Alpine Creek ran below Tunemah Lake. Two pictures, labeled Lower Alpine Creek and Upper Alpine Creek led me to believe that we crossed Dykeman Pass from west to east and then proceeded north up Alpine Creek to Tunemah Lake. I spent the next several days reading trip reports, searching Flickr albums and clicking on pictures in Google Earth. I wasn't sure what next I would find. I focused on the next picture. The caption held no clues, but the peak in the back right was very distinct. I thought I had found several matches, but none of the other peaks matched until I came across a series of pictures in Panoramio of Upper Blue Canyon. Yes! This was the basin of the Fishing Lake. The lake we stayed was likely one of the lakes in the top picture, in the upper reaches of Blue Canyon. I plotted it on my map, but still didn't know when we went. Good to hear from you. Nancy dug out the old albums and found the 1987 sierra trip from wishon to blue canyon. Lots of pictures of you,[and the rest of us]. We went over Coyote Pass at 10,500 ft on Monday then down to Blue Canyon creek. We stayed at Mt Meadow campsite on Sunday nite but were Kinda lost on saturday. We headed to Crown Basin(or valley) which we circled around. Hiking was hard over rocks. My trip plan with elevations and camp locations was not accurate due to us being lost on first day. It shows us camping at Alpine creek on sunday nite. Not sure how it relates to mountain meadow which Nancy says we stayed. She says we went toward Tunemah trail.. Stayed at lower Alpine Creek.Stayed at Upper Alpine Creek. Stayed at Tunemah Lake. Went to Polywog Lake and Lake 10212. Went over Leconte Divide and down to trail that took us back to Wishon. Stayed at trail junction on Friday nite. Went by Halfmoon Lake then over Camel pass(nancy's name) down to Kings River(north fork). I've taken a lot of Liberties trying to jive my trip plan to Nancy's pictorial so use this info with caution. Take out your topo and try to make some sense of all this. If you're interested in a copy of trip plan and pictures let me know an address to mail them to. OK, this was a lot of information to decipher, but at least held a rough outline. Some if it was out of order and some was based on his trip plan which we didn't follow. The trip occurred in 1987; I was 15 years old. We entered through Crown Basin, getting lost on the first day, which was a Saturday. For most of the rest, it was hard to tell which parts were simply part of his plan and which parts we actually did. I took to heart his comment, "I've taken a lot of Liberties trying to jive my trip plan to Nancy's pictorial so use this info with caution." I responded that, yes, I would love to receive more information about the trip and sent the email away with my street address, not knowing when I would get a response. I decided to focus on Camel Pass, which is when I remembered that Nancy had dubbed it that, based on a very camel-like rock formation. I was sure I could find it, since it sounded like from the description, it was near Halfmoon Lake, which was near Crown Pass. 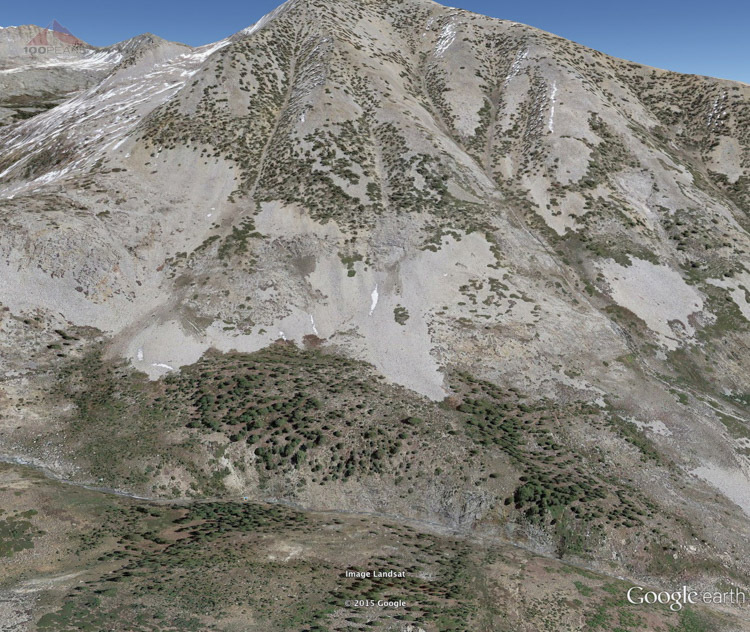 I scanned the topo and Google Earth. Why would we have climbed two passes in a day? And this pass was obviously above the treeline and not very many areas near Halfmoon Lake were above treeline and we had no business going there. It almost looked like Finger Col, but it wasn't it. After using boolean logic and removing real estate listings in my search results, I ended up finding a trip plan for a man named RoguePhotonic, who has truly epic adventures in the Sierra every year. His 2013 trip was no different. 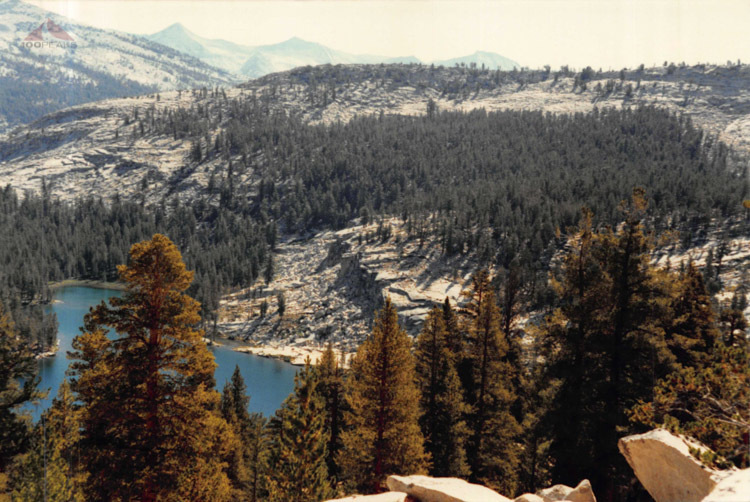 I saw he visited a Lake 10240, but it wasn't in the right area of the Sierra. Scrolling through his report, I noticed he visited Tunemah Peak. There was a link to his Flickr account, so I decided to go there and view his pictures. His trip pictures were amazing. The sheer number of miles and the scope of what he accomplished in a summer was hard to believe. While idly arrowing through them, vicariously journeying with him, something caught my eye. Yet again, I had found a clue. There it was. In the upper left corner of his picture. So small it could have easily been missed. What he called Mantle Pass, my Scoutmaster's wife had dubbed Camel Pass and confused me for decades. On one picture, she had even written Coyote Pass, which confounded my research even further. We had gone over this pass from the east, the reverse of RoguePhotonic. So we took this pass on the way out. I had found yet another data point to try and find out where we had gone. 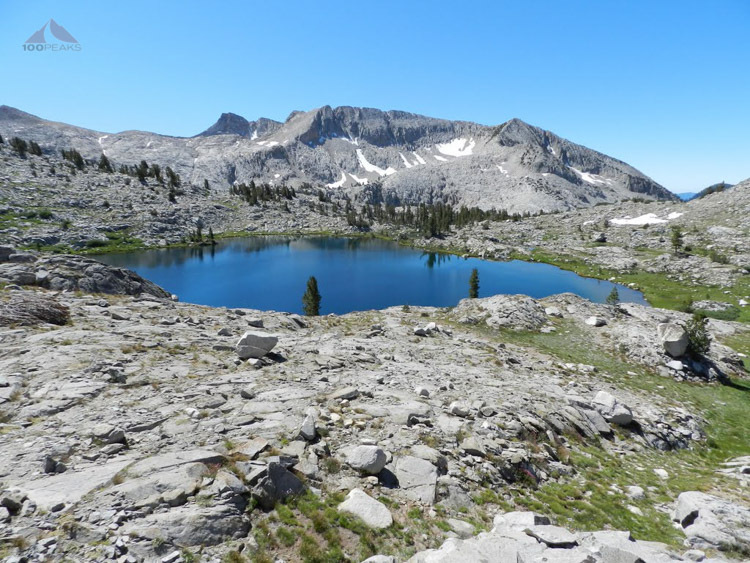 I also knew my Scoutmaster's words ,"Went by Halfmoon Lake then over Camel pass(nancy's name) down to Kings River(north fork)" were not correct, unless he was informally describing the lake just to the east of Mantle Pass. Camel Pass (Mantle Pass) is nowhere near Halfmoon Lake and Crown Pass. 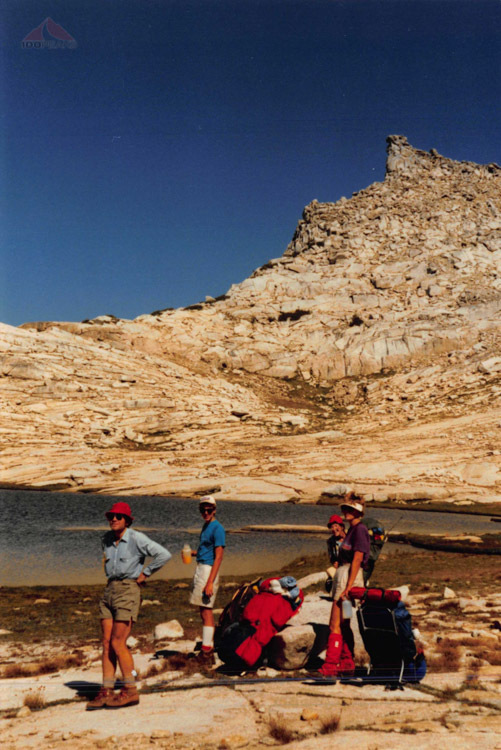 I found another picture of us, standing in a basin with towering granite giants around us. I was sure I could determine where it had been taken. I scanned around for basins that looked like this and found it almost immediately. I dare say I was getting good at this. We had exited through Crown Basin, a significant finding, but there were still large gaps in our path. I came to the end of my ability to figure out where we had gone. I still didn't know how many nights we stayed, where we had visited, and what direction we had hiked. I then got a package in the mail. It was an envelope with four topographical maps, marked with intended paths, a trip plan, which was an elevation profile charted on graph paper, and a stack of 63 photos, most of them different than the ones that I already had. This was going to be fun. I scanned in the photos, using the filenames to number them and included the captions, just like I did for my set. I started to see way more detail about our trip. Since I had looked at so many pictures of the area in question, I started to recognize some of the locations. I also had to scan Google Earth, too. But I found out so much about our trip that it became very clear that, even though we had grand plans to cover a wide swath of the LeConte and White Divides, following the Tunemah Trail, we only covered a small portion. These pictures above (and others in the sequence) told me that we hadn't gone over Coyote Pass, but a non-pass way to the north. We had then turned south and headed toward Big Meadow in Blue Canyon. Even though all the pictures were captioned with "Coyote Pass" I doubt that anyone knew we had been that far off until now. Using this, along with other photos, I determined that we hadn't visited this lake, which someone dubbed 'Polywog Lake.' My Scoutmaster had merely used a zoom lens to crop it a certain way. We could just see it from our cross-country path east toward Dykeman Pass, which was also a revelation. We had gone east over Dykeman Pass, the opposite of Bob Burd. We had actually followed the Tunemah Trail to Alpine Creek. However, we never made it to Tunemah Lake. Given the location of this photo, and what everyone was wearing, I determined that we didn't spend two nights along Alpine Creek, as my Scoutmaster noted. 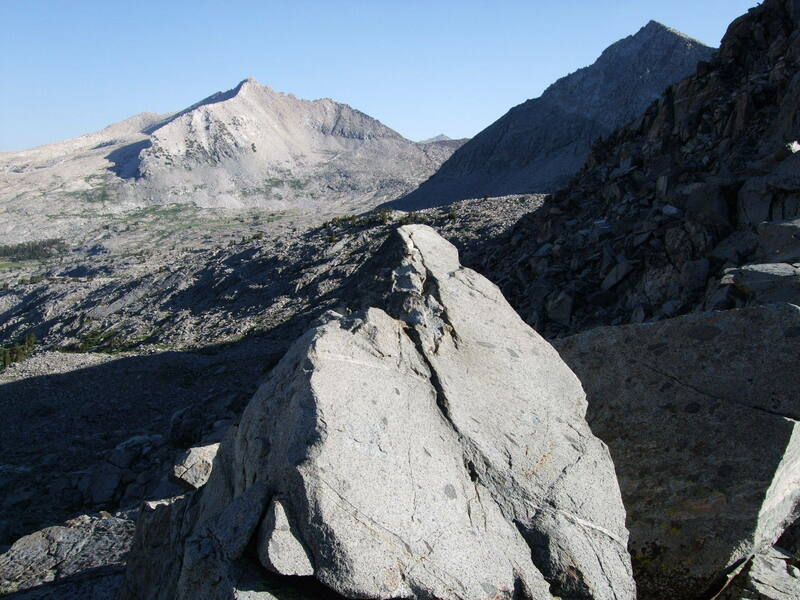 We spent one night after hiking the Tunemah Trail alongside Burnt Mountain and then hiked up the Alpine Creek drainage and out over Dykeman Pass. It's likely we spent two days at what the pictures call the Fishing Lake. After doing more research, I confirmed that my assumptions in the paragraph above were completely wrong. We then headed out over Mantle Pass and down into Crown Basin, ultimately camping one more night along the North Fork of the Kings River. I had done my research. I had put the pieces together. There were still some uncertainties, but, for the most part, I had solved the mystery of my trip on the Tunemah Trail to the White Divide. On Day 1, it's likely we got an early pre-dawn start and drove up from Orange County to Wishon Reservoir. We either got a ride or somehow met with a pack train who packed our backpacks into canvas sacks and packed them onto horses or mules. We then had the luxury of riding horses up and down over rough terrain for 4 hours, covering about 13 miles. I remember getting off the horse, covered with trail dust, which had also gotten into my nose and eyes. But we had covered a lot of ground. We got our backpacks on and started hiking. It seems from the pictures and from the email that we had almost immediately gotten lost. The next two pictures in the series read, "Where the heck are we?" and "Who knows?" All evidence I found indicated that we hiked out of the Crown Creek area and up into the area called Mountain Meadow. Given that we appeared to have missed the trail to go to Coyote Pass, I assume we camped far north into the meadow. There are no pictures of this part of the trip. 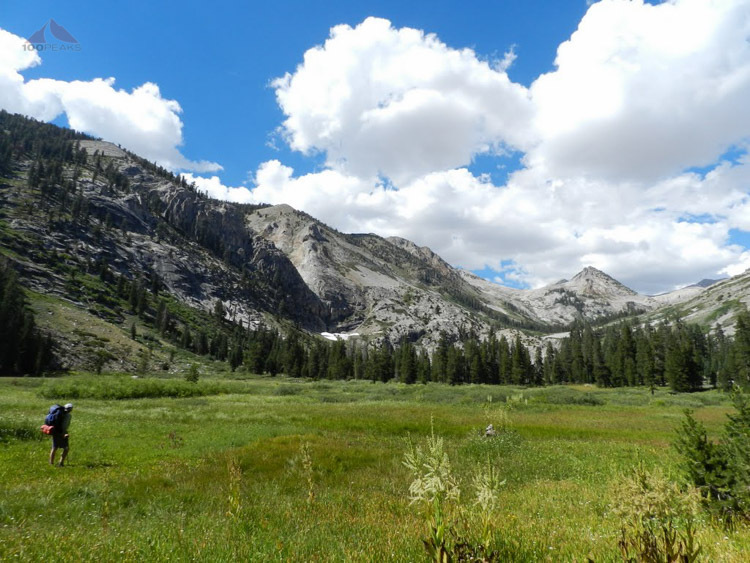 On this day, we headed east from Mountain Meadow, thinking we were headed to Coyote Pass. But all photo evidence clearly shows us coming down from Kettle Ridge to the north of Coyote Pass. Since it wasn't a pass, we ended up doing a lot of rock scrambling, which was challenging and slow going. We made it down to the bottom of the Blue Canyon, turned right (south) and found an old camp near Big Meadow. There were tree stumps to sit on, a table, and a raised rock fireplace. One of the pictures read, "Luxury!" Heading east, we found a trail up to the Tunemah Trail, which is a pass that travels to the north of Burnt Mountain. From all reports, and the pictures, it appears that, at the time, the trail was pretty much gone. The pictures and my memory serves that this area was choked with trees that had been downed by avalanches. It's funny to see that in many of the pictures, one or more people have a map out. We were constantly trying to determine where we were and if we were going in the right direction. In the picture above, we were in Big Meadow, wondering where the Tunemah Trail was. We found it and headed up toward the pass. Top of the pass where we were lost again! Three miles with full packs scrambling over scree, boulders, and fallen trees at 10,000' can wipe out the best of us. We made it to Lower Alpine Creek and made camp. I wore a poncho to keep the bugs off. This day was a little fuzzy, since there are few photographs. I think we made it a short day, but it still was all off-trail. I had initially thought that we had skipped a second night in the Alpine Creek area, since it seemed so short, but the following photos made me think differently. This day was a big one. We ascended the valley wall up and over rocky Dykeman Pass, heading for a distant lake on the other side of Blue Canyon. Given the long shadows in this picture, it's likely that we camped near this spot. A lake that we dubbed Polywog Lake is in the background. This is as close as we got to it. We angled to the right of this photo and headed up the steep canyon wall. Once we got to the top, we could see into Blue Canyon Basin, and the picture of me at the pass was taken once we had gotten to the other side. Although the lake was in sight, there was a little matter of getting there. Once again, we were faced with traversing what amounted to a giant avalanche of boulders. The going was slow. We finally made it to camp and enjoyed some time fishing and reading. For some masochistic reason, I brought the complete works of Edgar Allen Poe. Seriously, 15-year-old Derek? What were you thinking? To lighten her load, I believe that Nancy was tearing off pages of her book as she read them and feeding them into the fire. I probably should have done that instead of lugging that huge book all over the Tunemah Trail. It was over 800 pages! We had a nice dinner over the campfire, with freshly-caught trout. I remember being offered (and accepting) a little bit of rum that night, and someone brought butter flavoring for the trout. The setting was nice, a comfortable spot alongside the lake, what we called Lake 10240, but, according to my topo map, it looks closer to 10,400. It was glorious and a night I surely will always remember. The next day, we were to head out of the White Divide area by climbing over yet another steep rocky pass. We said goodbye to a great campsite and looked south down Blue Canyon. The caption of the picture below reads, "Leaving Crown Valley," but that is incorrect. We started climbing to Mantle Pass, just to the right of this picture. Once again we were ascending on large rocks. Once we neared the top, we stopped for a rest next to a high tarn. Nancy looked up and saw a large rock formation that looked like a camel's head. I imagine she said something like, "I'll call this Camel Pass." So she wrote it on all the pictures. Nowhere on the topos do I see Mantle Pass or Dykeman Pass by those names. I guess I don't have the correct topos, nor did we, 28 years ago. Crossing over the last cross-country pass of the trip, we descended into Crown Basin, probably got lost for a little bit, before we stayed on the bottom of the basin to meet the North Fork of the Kings River. We finally found a trail on the west side of the basin and starting hiking north and then made a wide turn around the basin below Portal Lake. We hiked a long day to make our last day as short as possible. We rewarded ourselves with a dip in the North Fork of the Kings River and some R&R in the sun. North Fork of the Kings River - Finally after 7 hour hike! On the last day, with a spring in our step, we headed up past Halfmoon Lake and over Crown Pass. The last pictures of this trip are solo shots of us, standing atop Crown Pass, looking eastward over the country we survived. For the rest of the day, we hiked over trails and terrain that we had just done in reverse the year before. I have no memory of this and there are no pictures of this. We exited just fine and probably went somewhere to eat several days' worth of calories. For the rest of the people who joined me on this trip, it was probably considered a fiasco. Or at best, not their favorite trip or even a forgettable experience. However, for me, I only went on three of these during my formative years. 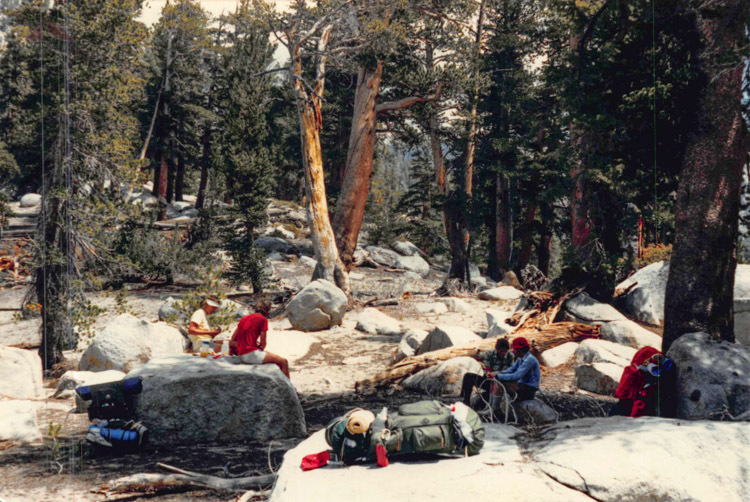 This was my final backpacking trip until I backpacked on San Jacinto, 20 years later, which was just an overnighter. During that span of 20 years, I had only car camped, visiting Joshua Tree many times, and Death Valley twice. I also visited Sequoia for a few nights with my now wife and her family. But no multi-day backpacking trips. It wasn't until my Mount Whitney trip in 2010 that I backpacked for more than one night. Part of the purpose of this exercise was to satisfy my curiosity about when and where this trip occurred. The other part was because it was fun to look at old pictures and figure out where they were taken. Some of it was like finding a needle in a haystack, and the thrill of discovery that came along with it. Now that I know the intended route, along with the actual one, an idea is forming in my head of making a trip out there to do this trip right, but also perhaps making a hybrid version of the two. We shall see. It was fun to relive the trip as I figured out the places and routes. It was fun to look into the faces of people I consider mentors. Mike, my scoutmaster, was the commensurate planner, creating the elevation profiles, planning every meal, and every route and every campsite. This trip didn't go quite as planned, but I remember the scenery being incredible and never being in a position of needing to be concerned for our well-being. Nancy, my scoutmaster's wife, took it upon herself to hike at my pace and make sure I wasn't without a buddy during this mostly trailless trek. I saw her as a substitute teacher after my first Whitney trip in 1984. We had hiked on that trip together, too. It's funny how many of my friends saw her as a strict authority. I saw her as a friend, a strong woman, and someone who I could count on. I only knew the other couple for the duration of the trip, so I don't know much about them, except they are currently living near the Sierra Nevada, if I am not mistaken. For me, as I look at that 15-year-old kid staring back at me through my monitor, I see a kid with a genuine smile at the top of Crown Pass. Happy to be almost done, or happy to be in such a gorgeous place. Or just happy to have that pack off for a bit and to be done climbing for the trip. Or just happy. Even for a little while. That's good enough.